We now have a Mammal gallery in place on the BirdGuides website. You can access this via www.birdguides.com/gallery or directly at www.birdguides.com/gallery/mammals. You can share mammal photographs and videos via the upload page. We're very excited to announce that we have completed a British and Irish mammals taxonomy on the BirdGuides website. This allows us to report rare and scarce mammal news from across Britain and Ireland, which will be of great interest to the large numbers of birders who are also keen to hear of notable records of other wildlife from the isles. A mammal gallery will follow in due course. Our British list has been updated. It currently includes 617 species, one more than the BOU's British list, as we have retained Fea's Petrel for listing purposes. Our rare birds archive has been updated to include all accepted records up to and including 2016. The BirdGuides website's has been updated to reflect the latest version (8.2) of International Ornithological Congress (IOC) taxonomy. This includes a major revision of the cuckooshrikes family (Campephagidae) and Phylloscopus warblers, as well as the splitting of Eurasian Magpie into four species. Due to sudden and unforeseen policy changes by Google, we have had to change our internal map provider on the website from Google Maps to OpenStreetMap. 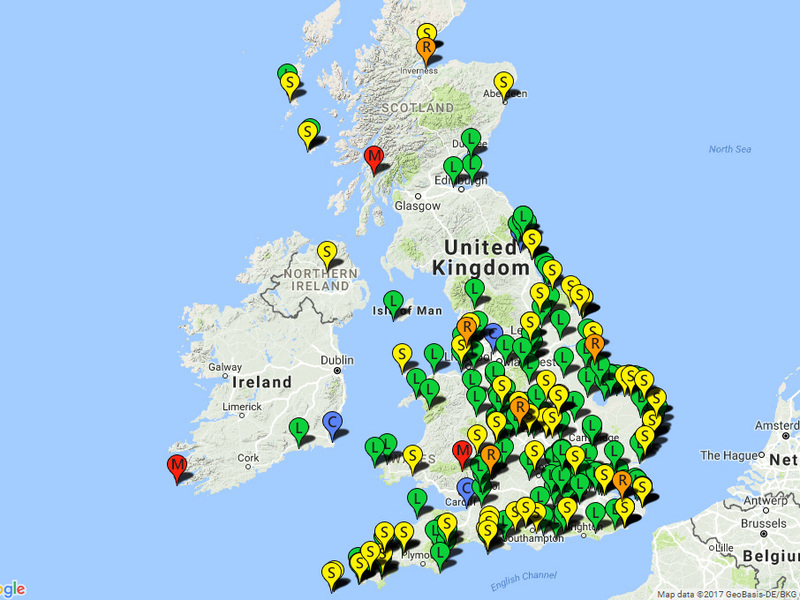 This means that the maps used across the website (eg on the sightings pages, BirdMap and site pages) will look slightly different from now on. If you spot anything you consider to be a bug or error, please email us with details of the problem and we will look into it right away. Please note that the BirdGuides app is unaffected, as are your own preferences for external maps. It is now possible to update your preferences for our sightings page so that it shows only the current day's news. To update your preferences, either tick the box next to 'Today's sightings' in the Search Options box and click the orange Apply button (see below), or make the change at the Update My Preferences page. The page now provides details on all birds that are or have been present in the past 24 hours, are significant rarities (classed as BirdGuides rarity level of scarce or rarer) and were first reported at least a day ago. Longest stayers appear in descending order, with the longest staying rarities appearing first. There is also a map view at the bottom of the page, which allows users to easily visualise the whereabouts of each listed long stayer. Taxa names are now clickable in news stories and articles, with these linking directly to the taxon's page in our Species Guide. 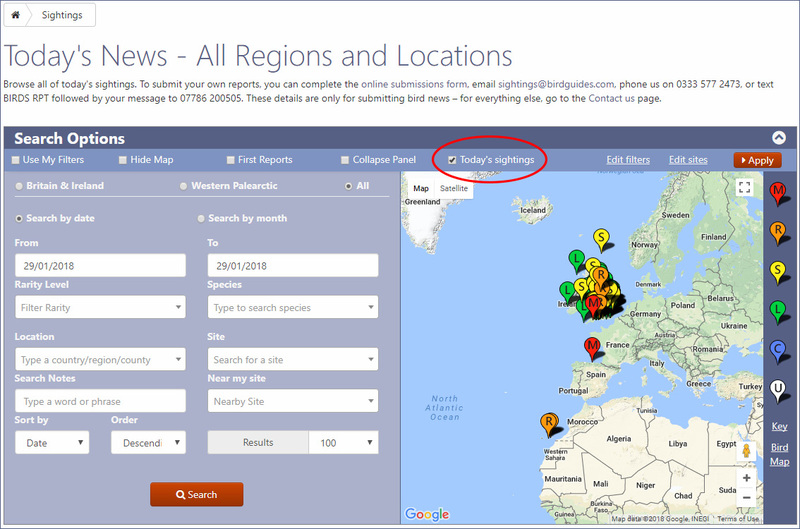 We have published a step-by-step guide to using the 'Nearby' function on the sightings page. You can read it at www.birdguides.com/articles/how-to-set-up-and-view-nearby-news-on-the-birdguides-sightings-page. We have updated the BirdMap coding so that rarer reports now overlay commoner reports, meaning that they do not become 'lost' among the mass of reports when the map is viewed at a higher scale. It is now possible to specify up to two email addresses on which you would like to receive Email Alerts. To add these, click on the grey 'Settings' button located to the right of the orange 'Create New Alert' buttons at www.birdguides.com/my-account/my-alerts. It is now possible to add 'nearby' locations to tailor the sightings page even more specifically to your requirements. Some users were reporting that maps associated with sighting reports were showing wayward markers in incorrect locations. The bug was identified and has been fixed; now pins should display at the correct locations for all users. Please email us if you are still encountering issues with wayward map pins. Update your Preferences, such as 'Use My Filters', 'Hide Map' and 'Collapse[/expand] Panel' with just two clicks. Search by a specific month in any year, or search for keywords in the notes of sighting reports. Furthermore, the BirdMap has been updated to aid visually impaired users. Each pin on the map is now represented by either M, R, S, L, C and U (Mega, Rare, Scarce, Local, Common and Ungraded reports respectively) as well as the existing colours. Our technical team continues to work on enhancements to the website. Many of those in the past week relate to our internal admin systems, helping us to get the news out more efficiently and keep other areas of the site up to date, but one important fix relates to the focus of last week’s ‘Site Tips and Tricks’, Galleries. When using the photo uploader, after your first image has been submitted it’s now possible to upload subsequent images using all the same details – everything from species name, date and location to equipment and your name will be auto-filled in the submission form, making it a simple and much more rapid process to upload multiple images of the same bird taken at the same time. This improvement was requested by some of our many regular contributors, and will allow everyone to get more of their images up onto the site in significantly less time than previously. To see what’s been uploaded in the BirdGuides community recently, click the following links to our Birds, Butterflies & Moths and Dragonflies & Damselflies Galleries. The Nearby function app function on the BirdGuides app now uses your location to return reports within a 40 km radius of your position over the past seven days [previously three days].